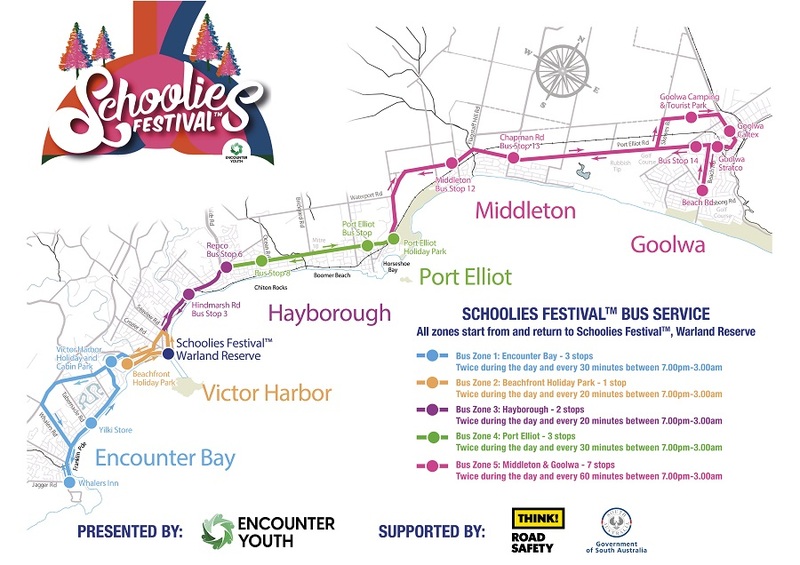 Book a seat on the Free MAC Schoolies Festival™ Bus from Adelaide to Victor Harbor. It stops at all of our Endorsed Accommodation Providers across the Fleurieu from Victor Harbor and Encounter Bay, all the way through to Goolwa. Buses depart from the Adelaide Central Bus Station (85 Franklin St, Adelaide) on Friday at 10:00am or 2:00pm. There is also a return bus on Monday, leaving the Fleurieu in the morning or afternoon – check the free Schoolies Festival™ App for approximate times. Please note: you need to book the Friday and Monday buses separately! If for some reason you don’t want to get the free bus, we suggest you leave your car at home and get your parents to drop you down. Not always the coolest thing to do but it is one of the easiest, safest and, of course, most reliable options. You could catch a private Link SA Bus. Link SA operate services from around the state to Adelaide and from Adelaide to Victor Harbor daily. Call Link SA on (08) 8339 7544 for more info. When you purchase your ticket to Schoolies Festival™ you’ll get FREE unlimited rides on the Free MAC Schoolies Festival™ Bus. You can catch the bus during the day and to and from the Festival at night. The service runs right through until the close of Festival. There will be stops at all of our Endorsed Accommodation Providers from Victor Harbor and Encounter Bay all the way through to Goolwa. Check out the free Schoolies Festival™ App for maps and schedules. Click on the image to download your copy of the bus map. Or click here. Find out more about Encounter Youth.